Just in the nick of time, I’ve discovered an awesome present for the hard-to-buy-for kids left on my gift list! The perfect present for those children that seem to have plenty of everything already – give the gift of gardening. Gardening gets kids up and outside, plus gives them a sense of responsibility as they nurture and care for their Planet Eco seedlings. 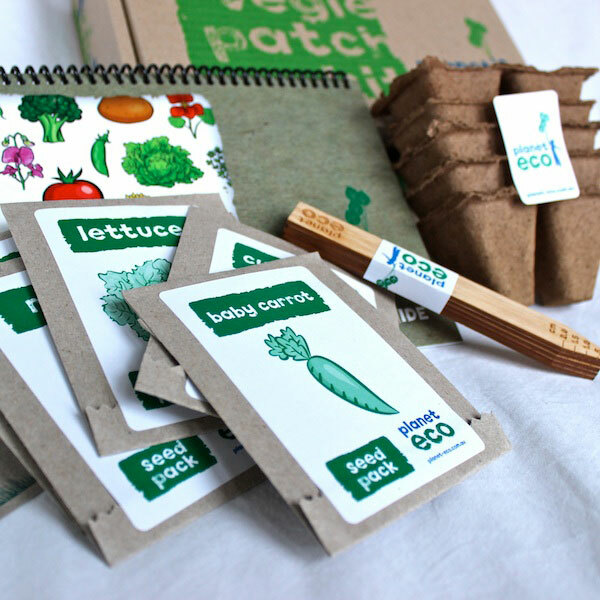 I love the Planet Eco Vegie Patch Kit – and I know my six-year-old will love it just as much, especially when he can reap the rewards and eat his produce! The Vegie Patch Kit ($24.95) includes five packs of organic seeds for you to grow – baby carrot, cucumber, lettuce, radish and rocket – the perfect salad to munch on. There are five bamboo plant tags. ten organic biodegradable dotpots and a Planet Eco guide to growing your plants all contained in a fabulous eco-style gift box. Planet Eco also have extra seeds, tools and accessories to make your gardening experience all the more rewarding, or if more than one child will take part in the tending to the garden. Herb Patch Kits and Flower Patch Kits are also available for $24.95 from Planet Eco.